Anyone who knows me can probably guess why I picked this one up. Because it has an elephant on the cover, right? WRONG. Okay, partially right. But also because it was featured in a Best of Middle School hour long book talk I went to last year! I remember the book-talker mentioning the beautiful watercolor illustrations that accompany this graphic novel, and boy, was he right. They are GORGEOUS. (My instagrammers might have seen my grams.) The colors make you long for midwestern summers on the lake. 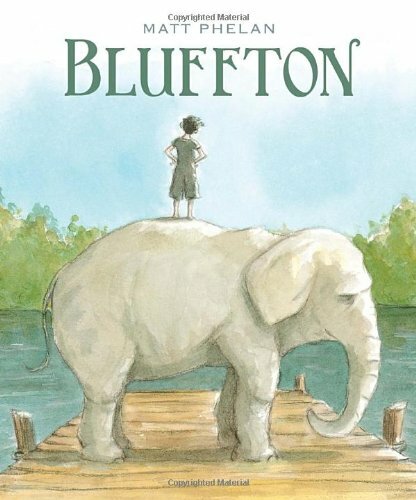 Bluffton starts in the year 1908 when young Henry Harrison notices a train full of vaudeville performers arrive in his sleepy town. One of the vaudeville families are the Keatons, one of the premier performing families in the country. The oldest son’s name is Buster. (For old Hollywood fans, this name is probably familiar to you. For those who it is not, no worries.) The Keaton family act is known for their slapstick comedy, and Buster is the best at it. Later, he would go on to become one of the greatest silent film actors ever known, including his film The General, which AFI ranked #18 in their list of 100 greatest American films ever made. A lot of readers on Goodreads gave this just an okay review. They said that the intended audience wouldn’t appreciate it, that today’s kid readers don’t even know who Buster Keaton is, etc., etc. I however, disagree. Frankly, as a junior high librarian, I had a hard time not selling any graphic novels to kids. They fly off the shelves no matter the subject matter. Attach a good recommendation to it, and I’m likely to have a hold list on it for weeks. Plus, a lot of kids, at least my students, loved seeing glimpses into “things that were real.” They think non-fiction graphic novels are awesome, and while this is historical fiction, I think it would have the same appeal. Lastly, the ART IS AMAZING. The watercolor work is just beautiful, regardless of the story. And actually lastly, who cares what the “intended audience” was? I’m a 27-year-old non-Buster Keaton fan, and I enjoyed it! In fact, it made me want to check out some of his films! Honestly, I’m guessing that is much more the intention of the author — to get a new generation interested in something he finds wonderful. Lovely. Plus, there’s an elephant on the cover. A couple years ago, I took a creative non-fiction writing class “for fun” to round out my last semester of college. It ended up being one of the most consuming classes of my college career. It’s a difficult thing to write interesting, purposeful, and honest prose featuring your life, and have it be something you’d actually be okay with someone else reading. Ghostbread is the kind of thing I aspired to write. It is just lovely. Sonja Livingston grew up as one of seven children in a single parent household. While providing for seven kids is difficult for any family, Sonja’s mother struggled particularly, and the children grew up in extreme poverty, moving from apartment to house to reservation to motel to friend’s house to another friend’s house to home. It was far from a stable environment. And yet, the love and sibling bonds held the family together throughout the turbulence and uncertainty. The story arc isn’t what captured my heart on this one, though. Instead, I was fascinated by Livingston’s prose. Let me tell you, each sentence packs a punch. She structures the narrative into compact 1-2 page stories, and each is led by a powerful first sentence that sets the tone for that piece. “When you eat soup every night, thoughts of bread get you through,” she writes as she begins discussing the meals while on the reservation. Or of elementary school, “At school, I learned to read and write and use spit in creative ways.” And later, revealing a thought common to many of us in adolescence, “No one told me the thing I most needed to know.” Each beginning line carries you to the next line and you can’t help but read through the rest of the story. To put it simply, it’s captivating. The well-deserved winner of the Award for Creative Nonfiction (from the Association of Writers and Writing Programs), Livingston’s book is highly recommended for any fans of this genre or any readers wanting to get an inside view of what it’s like to grow up hungry.